Anyone with a keen interest in saltwater fly fishing will likely find their Facebook news feeds loaded with captivating images of glamorous flats trophies such as bonefish, permit, tarpon, and the occasional redfish. While angling for the species is some of my favorite fishing, there is so much more to saltwater fly fishing. If there’s one reason people write off saltwater fly fishing, it’s because flats fishing looks too expensive, time-consuming, and difficult. As a Mid-Atlantic saltwater guide, I want to debunk all these fears, especially the “too difficult” part. Anglers willing to look past the glamour shots will find that amazing saltwater fly fishing opportunities are everywhere. Most saltwater angling opportunities are an easy drive from a large percentage of our fly fishing population. From New England down through Chesapeake Bay, striped bass, false albacore, blue fish, and spotted sea trout are abundant. I learned to fly fish on the Chesapeake 30 years ago and it’s an ideal place to get started. From my home waters in North Carolina through Georgia, red drum, sharks, cobia, and jacks are added to the mix. All of Florida, including the Gulf of Mexico, has unlimited opportunities that go way beyond flats fishing. Throughout this wide area, there are welcoming guides and great fly shops that take pride in helping novices get a taste of the salt. 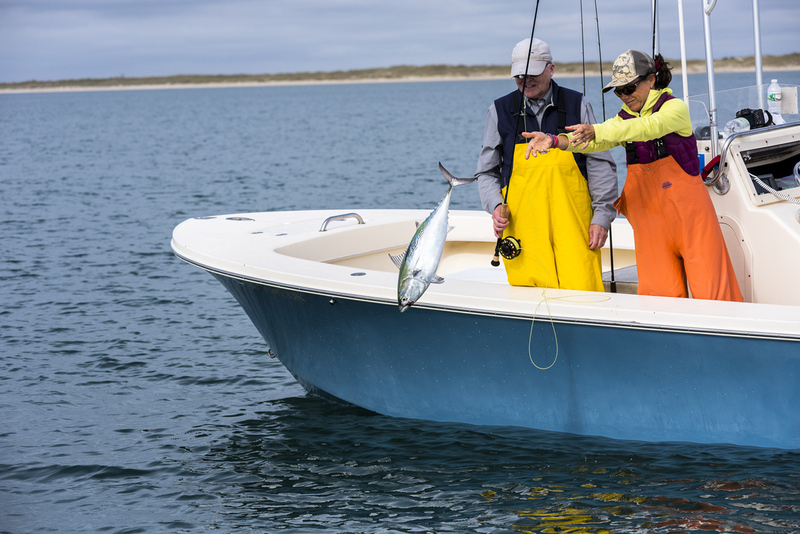 A particularly addictive and beginner-friendly fishery happens each fall along the southern Outer Banks of North Carolina. It’s a beautiful time of year to be on the water. The weather is mild and boat traffic is lighter. After the first brief cold fronts roll through in September, shallow water temperatures begin to drop and this starts a baitfish migration. Smaller fish begin to flow out of the sounds and into the warmer ocean for the winter. Predators come in from deeper water to the inlets and fatten up on the migrating bait. The inlets become smorgasbords. The term “feeding frenzy” totally applies to this situation. 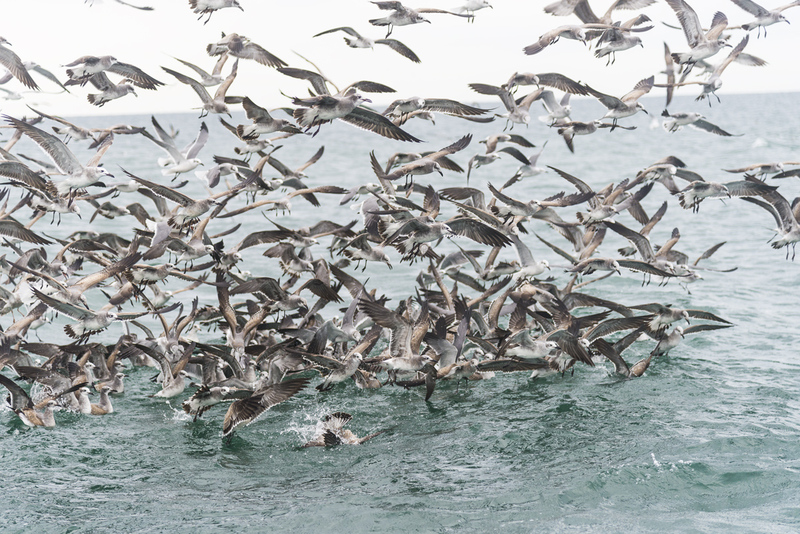 From late August through December, balls of frightened baitfish are easy to spot as they are being shredded by predators from below and mobbed by gulls from above! This rampage is not just visually stunning, it’s also a great way to fast track all of your saltwater skills. 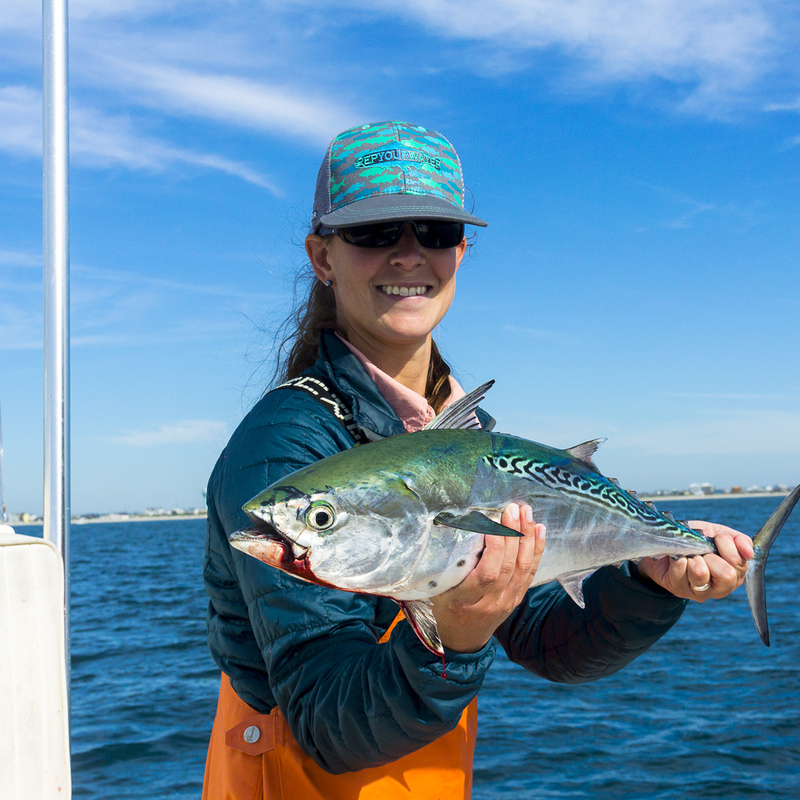 North Carolina’s fall predators include false albacore, bluefish, and Spanish mackerel. The false albacore, also known as albies, cores, and fat albert, get most of the attention, and for very good reasons. These atomic-powered predators are fast, powerful and never give up. They can get big too, running from six to 20-plus pounds. Their propensity to run and pull hard means rigging up with stout fly tackle in the nine to 10-weight range. I have guided plenty of flats fishing fanatics who feel that albies provide a harder and longer fight than any bonefish. I agree. Early in the fall, we have unlimited numbers of bluefish and Spanish mackerel. These smaller fish can be caught on six- to eight-weight rods and are perfect fare for beginners as they are abundant, greedy, and don’t require heavier albie tackle. Macs, blues, and albies all love poppers so the bites are violent and at the surface. Blues and mackerel prefer the warmer water of early fall, as do I. Many days are spent fishing in shorts. My clients may still face wind and chop, but at least they are not cold. That aforementioned wind is a factor in open water, but there is no substitute for getting out there and learning how to work with it. I can position my boat many different ways to help maximize a person’s abilities. I can even hold the boat in reverse, upwind of a bait ball, so anglers can roll cast downwind into the fray. If the fly gets close, it gets bitten. I love the odds. The best thing about this fishery is that it puts fly anglers in many different situations that improve casting ability. People can slowly master water hauls and double hauls in real-life situations, and blitzing fish allow anglers to make casting mistakes and still catch fish. Casting on grass or at a local pond is great, but there is no substitute for casting to a living, moving target on a rocking boat. The learning doesn’t stop when the fly hits the water. 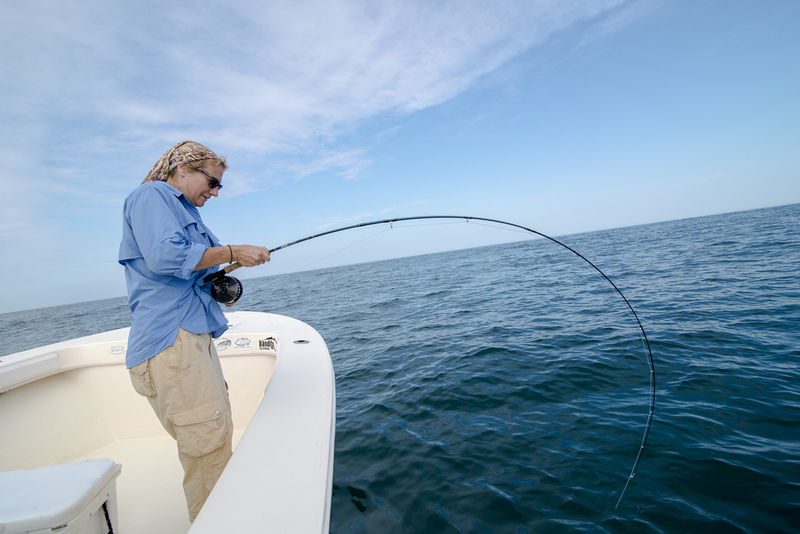 The biggest difference between saltwater and trout fishing is the retrieve and the hookup. We actively swim the fly back to us and keep the rod tip down to set the hook. This cast and retrieve combination is called the “fishing position.” It is universal in saltwater and has some applications in fresh, too. Many of my novice saltwater anglers get to see their backing for the first time when fishing for false albacore. Watching people react when they connect with a fish totally makes my day. Expressions of joy are followed by horror as line and backing rip off the reel. Saltwater fish take off for the horizon or they hunker down for a good wrestling match. This is when most “zing pows” happen. Lines wrap around rod buts, lines get stepped on or folks panic and clamp down on their reel. When flats fishing you might only get one or two chances to cast at a fish in a day. That does not leave much opportunity to learn from your mistakes. Practice really does make perfect and albie fishing provides endless opportunities to screw up. Blitzing fish will also test knot-tying skills. Many of North Carolina’s fall critters have teeth and run hard, so we get a lot of break-offs and bite-offs. The upside to losing flies is being able to practice your knot-tying skills. Spending a few minutes sitting side-by-side with a guide to perfect a knot after a bad break-off is a great way to move past the trauma. There is a term in guiding called “learned helplessness.” It happens when the guide does everything for the client. Pampering is nice, but it doesn’t make a better angler. It’s far more rewarding for everyone when clients get confident and comfortable choosing flies and tying their own knots. Adaptability is another great skill to have in saltwater fishing. Many species, especially striped bass, will feed on the surface only early in the morning or in low light, but move to deeper water and continue to feed as the sun gets higher, which requires a different setup. To stay in the game, anglers have to move to a sinking line and potentially heavier rod. Casting a sinking line is not difficult, it just requires a change in casting stroke and timing. Being able to adapt to different tackle and techniques makes for a better overall fly angler. 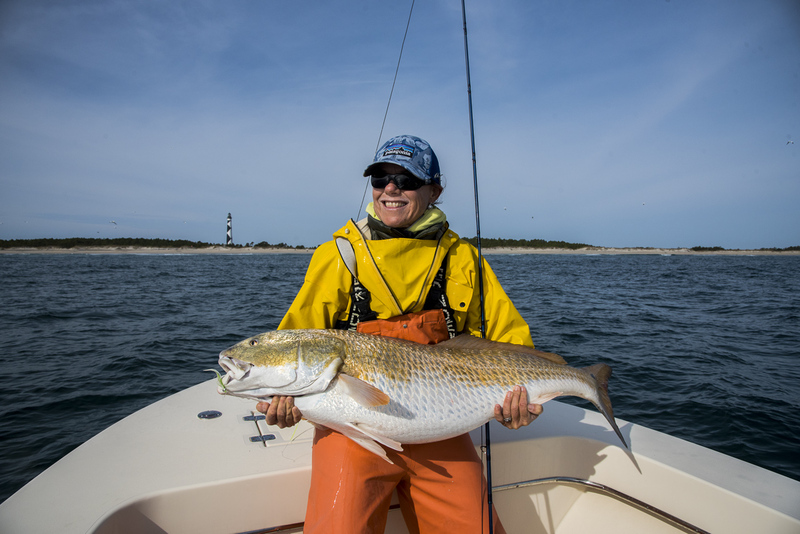 Another exciting fall species that requires adaptability are sea-run, trophy sized red drum. These bronze- and orange-colored brutes make brief surface appearances along the ocean beaches all fall. Sometimes feeding birds give away their location. Other times, spinner sharks jumping 20 feet into the air pinpoint the schools. We find them together because sharks and drum eat the same food. Pulling into a mixed school of 50-pound drum and sharks devouring terrorized baitfish is unforgettable. It’s one of the things I live for. When we find a school of drum, the albie rods are quickly put away and 10- to 12-weight rods armed with sinking lines are pulled out. I move the boat as close to the school as possible without scaring the fish so my anglers can make short casts where we can control the sink of the line. These greedy fish will eat the fly if they see it. The key is waiting for the fly to get down. Sometimes we only have to get it down a foot or two, but other times we may have to get the fly down around 50 feet. Once hooked these fish don’t like to move. We call it bulldog mode. Catching one of these trophies is more about acting quickly and being patient enough to let the fly get down than it is about casting well. Big drum off the beach don’t happen every day, but we are always ready. 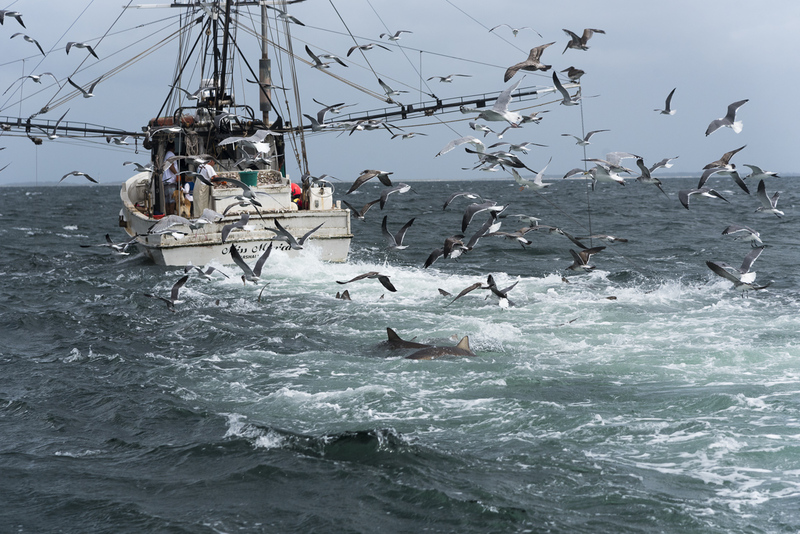 Catching albies behind trawlers is another way to quickly get educated. North Carolina has a fantastic shrimp fishery. These tasty crustaceans are harvested by trawlers that work just off the beaches in the same water as the albies. Any fish that the trawlers can’t sell are sorted back into the water, which creates an unlimited food source for predators. Eventually these fish tune in to the sound of the trawlers running. Some years the albies don’t gravitate to the trawlers, but for the past two years it’s been EPIC. When there’s a good feed on, I motor near the trawler’s stern and have my clients cast before I drift the boat back along the trawlers wake until they hook up, which they almost always do. Then we try to strategically ease away from the trawler and any other boats that are nearby … which there almost always are. These albies are well fed and shark averse, so they run hard and they don’t care where! Many rods and fly lines have died in trawler albie battles in the past few years. One fly shop owner/guide started selling fly lines on the water this fall! Many hooked albies are eaten by sharks in an explosion of blood, while my clients watch in gleeful horror. 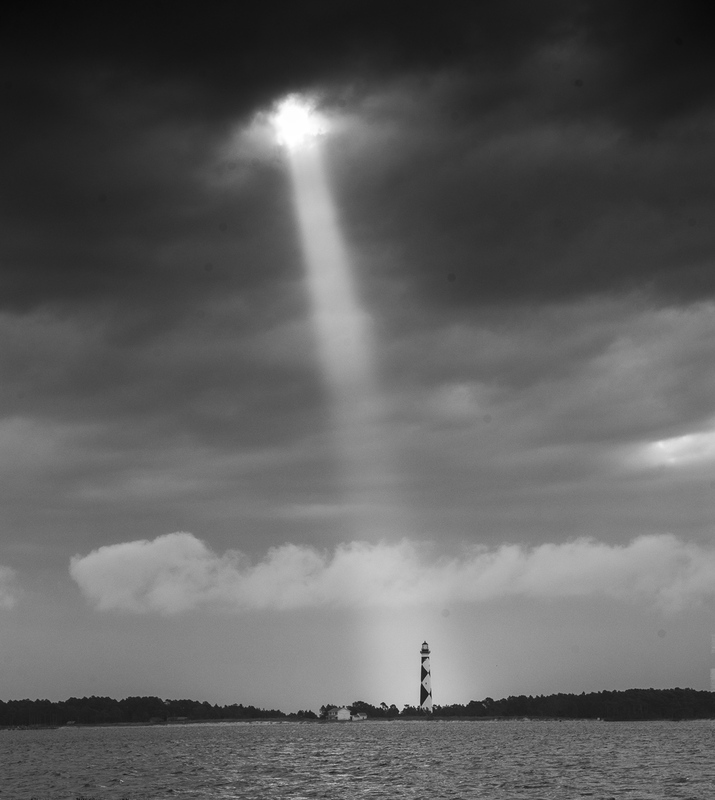 Fall along costal North Carolina is great for all fly anglers, because there is so much to catch and experience. It’s extra gratifying to see novices become successful in this game and know that their new skills can be transferred to other saltwater situations, including the flats. The fall fishery is great preparation for Baja roosters, dorado, and Christmas Island trevalle. Throughout the year, the East and Gulf coasts offer equally exciting opportunities for adventure and skill building with guides who love to share their experience. Before thinking that saltwater fly fishing is just a faraway dream, look a little closer to home!